John 10:11–18 11“I am the Good Shepherd. The Good Shepherd lays down his life for the sheep. 12The hired man, who is not a shepherd, does not own the sheep. He sees the wolf coming, leaves the sheep, and runs away. Then the wolf attacks the sheep and scatters them. 13Because he works for money, he does not care about the sheep. Recently, I have enjoyed illustrating my sermons with famous works of art. But, I can think of no better image to illustrate Jesus as the Good Shepherd, than our own Good Shepherd window. This window was created for the building of our new church in 1927. It cost a mind-blowing $250 91 years ago. I cannot begin to imagine how expensive it would be to replace that window today. It is an idyllic scene of Jesus with about a dozen sheep around His feet. There is cool, quiet water in front of the flock. There are green pastures behind them. Jesus is holding a lamb in each hand for safe-keeping. One of the lambs looks up adoringly at his Shepherd. When the church was originally built, the window was on the outside of the church and the morning sunlight would shine through, giving life and vibrancy to the colors in the stained glass. I have been told numerous stories of Pastor Jaster, one of Epiphany’s first pastors, standing outside during recess, protecting the window from errant kickballs. When the church was added on to, a wall was created four feet behind the window. We don’t have to worry about anymore kickballs. Now, the light that shines through is from six bright bulbs on the top and bottom of the window. 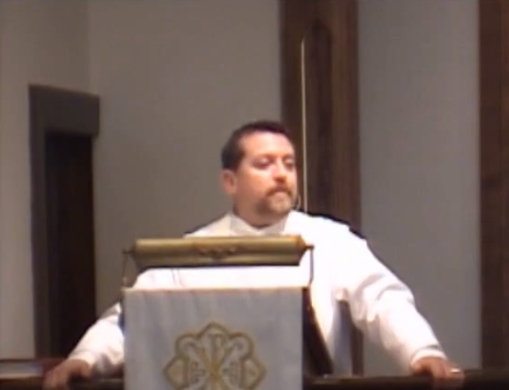 For the majority of funerals I have preached at Epiphany, my sermon text has either been on John 10, the Good Shepherd chapter, or Psalm 23, the Lord is my Shepherd psalm. I believe that one of those texts is chosen by the family of the departed saint because their Christian family member has sat for decades in these pews before this remarkable window so clearly depicting Jesus as the Good Shepherd. The Scriptures repeatedly refer to us as sheep. As a sheep, do you ever feel lost, alone, afraid? Weighed down with burdens and cares and worries? Malnourished and weak? Wary of others reaching out to you? Of course, you do. We all feel that way at times. And for good reason. The Bible says, “All we like sheep have gone astray, each of us has turned to his own way” (Isaiah 53:6). We hurt. We despair. We are weighed down. We get into trouble. And we wonder, “Why? What have I done to deserve this? What am I doing wrong?” Hopefully, we then begin to open our eyes and really look at our situation more clearly. Because we have gone our own way, our wandering us led us out of the pasture and into a barren wilderness. God wants us to enjoy the nourishment He has provided in the pastures of His holy Word. He wants us to enjoy peace and safety with fellow Christians in the flock of His Christian Church. He wants us cared for by a pastor who is the Good Shepherd’s under-shepherd. But our wandering away from the Shepherd, His flock, food and protection gets us into trouble. And there is much trouble to get into these days. Many of our troubles are brought on by ourselves and our sins. Some of our struggles are because we are living in a sinful world that is a dark valley of death. And sometimes we are tormented by the devil and his pack of demonic wolves who are attacking us on all sides. We are not only wandering in the barren wilderness … but we are wandering alone, lost, afraid, weighed down, without nourishment, without a Shepherd to protect us, attacked by wolves. We have been following our own way down the path of pain, sorrow, and suffering … and eventually to hell. We are like sheep. And sheep need to be tended. We need a Shepherd. We need someone to keep us from wandering, someone to point out the dangers, someone to remove the weight of the world’s pressures, someone to feed and nourish us, someone to lead us in the right direction, in the safe direction, towards green pastures. Sheep need a shepherd. And not just any shepherd, but a good one, a faithful one, one who loves the sheep. A shepherd who loves his sheep so much that he is even willing to die for them. As a youth, I used to go with my dad while he sheered other farmers’ sheep. He did the sheering. My job was to catch the sheep and bring the sheep over to my dad. I would then flip the sheep onto its side and hold down its head, so its wool could be shorn. Now, if a thief or a wolf would have tried stealing or attacking the sheep while I was there, to be honest, I would have let them. They weren’t my sheep. I was less than a hired hand, because my dad wasn’t paying me for catching sheep, let alone dying for them. Jesus compares Himself to a hired hand when He teaches: “I am the Good Shepherd. The Good Shepherd lays down his life for the sheep. The hired man, who is not a shepherd, does not own the sheep. He sees the wolf coming, leaves the sheep, and runs away. Then the wolf attacks the sheep and scatters them. Because he works for money, he does not care about the sheep” (John 10:11-13). Jesus, though, is a Good Shepherd, He is willing to lay down His live for His sheep that He loves. Jesus is prophesying what He will do within a few months: He will give up His life on the cross. Jesus does not leave His flock unattended. He confronts the dangerous wolves and promises what is written at the bottom of the stained-glass window: “Neither shall any man pluck them out of my hand” (John 10:29). As lambs and sheep, we may wander; we may stray; we may leave Jesus’ protection. That’s on us. But, no devil, demon, or danger can ever pluck us out of Jesus’ hands or remove us from His protective gaze. That’s on Jesus. When the dark valley of death comes before us, Jesus does not leave us and say, “I’ll see you on the other side.” No, He guides us through that dark valley. He knows every step of the way because He has walked it Himself with His own death on the cross. But, Jesus promises more than just dying for His sheep. What good is a dead shepherd? Then the wolf is free to kill and devour the sheep at will. Jesus, however, is the only Good Shepherd who freely lays down His life for His sheep and then takes up His life again. This way, He keeps His sheep safe with Him until He leads them into the eternal sheepfold. “This is why the Father loves me, because I lay down my life so that I may take it up again. No one takes it from me, but I lay it down on my own. I have the authority to lay it down, and I have the authority to take it up again” (John 10:17,18). We are surrounded by wolves, lions, and serpents with forked tongues and venomous words. We are like lambs in this hostile environment. Lambs have no fangs, claws or the ferocity to defend themselves from hungry predators. Lambs have no hope against wolves, lions, and serpents with forked tongues and venomous words. Jesus is not just a Shepherd when the grass is green and the sun is out and everything looks cheery and optimistic. Jesus perhaps shows His utmost power and salvation when the valley is dark, the hope appears gone and the struggles are the greatest. That’s why the words between the altar and the Good Shepherd window are so important. “Lo, I am with you alway” (Matthew 28:20). I get asked by new people where is the “s”. In 1927, Epiphany’s saints were using the King James Version of the Bible. With or without the “s,” the promise is the same. Our crucified and resurrected Shepherd is always with His flock. We are always protected from our enemies. Look at the One who made that promise of His abiding presence to you. Jesus does not run away when the enemy approaches. He’s not intimidated by ravenous wolves. He’s not frightened by roaring lions. And, though He has been pierced by serpents with forked tongues and venomous words, He allowed that to happen so that He might crush that Ancient Serpent’s head. Jesus places Himself between you and your enemies. Jesus plants Himself between you and your sins. He mediates between you and the wrath of God you deserve. He is the One who called you out of the dark, dreary dessert of sin and unbelief and into His wonderful green pastures and toward His quiet waters. He is the One who declared you not guilty of any sin or straying by becoming guilty in your place. Here we see the greatness of our Good Shepherd. In His death, the Savior ensnares our enemies. Although He, Himself, is captured, He captures the devil. Although He dies, He destroys death. Although He is slain, He undoes the work of the grave. Although He takes our sins, He endures our punishment. Although we deserve it, He suffers it. Although the hired hands flee, He remains at His post. He is fixed in place as our Savior. He is nailed to the cross as our Redeemer. In this, the Shepherd laid down His life for the sheep. When Jesus was crucified on Golgotha, He was in control. Nobody killed Him. He willingly gave up His spirit (Matthew 27:50). “No one takes it from me, but I lay it down on my own. I have the authority to lay it down, and I have the authority to take it up again. This is the commission I received from my Father” (John 10:17,18). He kept His promise to His Father, by fulfilling the promise He made to us. He allowed Himself to die, so that He might take His life back up again. He gives us life by dying our death. He gives us His seat of honor at the wedding feast of the Lamb by being forsaken, tossed out of the Trinity, and bound hand and foot at Calvary’s cross. He washes our filthy lives of sin clean through His shed blood. His suffering is our healing. His death is our life. His resurrection is our hope. All that is wrong with us is made right in Him. Though we wander, the Good Shepherd searches. Though we stray, He finds. Though we push away, He pulls us back. Though we enjoy the polluted waters and unhealthy meals of this world, He nourishes us through the bread and water of life which is His holy Word and Sacraments. When you were baptized, the Holy Spirit made you a lamb in the Father’s flock and placed you into the hands of the Shepherd for safe-keeping. As you grew older and matured in your faith through feeding on God’s Word and Sacraments, you became one of the sheep around the Shepherd’s feet. When you die, that Good Shepherd brings you through the dark valley of the shadow of death and places you into His paradise filled with green pastures and quiet waters. What a blessing, every time you sit in these pews, you can know that comfort; receive that comfort; see that comfort. You are His lambs and sheep. He is your Good Shepherd. Amen.